Understanding Foot Problems Caused by Diabetes People living with diabetes often suffer from pains in their feet caused by peripheral neuropathy. Find out how to treat neuropathic pain here in this video. Diabetes is a serious disease that impacts the lives of over 24 million Americans, according to the American Diabetes Association. This common illness wreaks havoc on a person’s body. 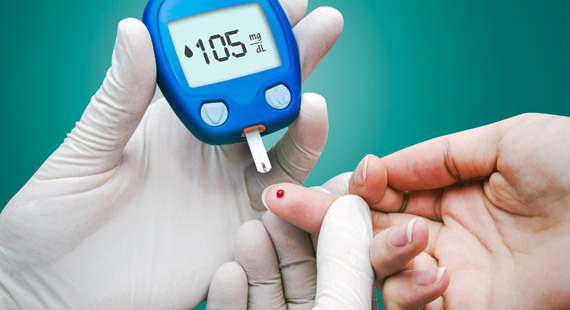 From fluctuating sugar levels to serious foot trauma, the best way to care for diabetes is to seek care from a doctor. Diabetic foot care does more than help you feel better on your feet. It improves blood flow, helps heal foot ulcers, and works to prevent your feet from amputation. One of the most important things you can do for your body is educate yourself on the risks you’re up against when you have diabetes. By having a strong understanding of the types of risks you face, you can do what’s necessary to stop damage to your lower extremities before it’s too late. Scrapes, blisters, and open cuts on the feet are uniquely dangerous to the patient with diabetes. These injuries do not heal as quickly on diabetic feet as they do on healthy feet. Daily inspection is a must! If you notice an open wound starting to look red, it is important that you seek treatment. Even if you don’t feel a tremendous amount of pain, you could still be at risk of developing an infection because of poor blood flow or a weak nervous system. Diabetic patients also have uniquely brittle bones. This increases the chances of your feet getting fractured or having the bones disintegrate over time. As that happens, you develop small pressure points that are extremely painful. Your foot might change shape, making it difficult to walk or move normally. This is called Charcot foot. Peripheral Arterial Disease (PAD) is common among persons living with diabetes. It is characterized by poor blood circulation. When your feet are injured, it becomes harder for the healthy blood to reach your feet and heal your wounds. This can contribute to other serious conditions, such as an infection or a foot ulcer. Do your feet feel tingly? Are there times when you feel like you might lose your balance because your feet feel numb? You could have serious nerve damage in your feet. Neuropathy damages nerve endings in your feet causing a burning, tingling, numb sensation. This makes regular activities, such as walking, standing, or moving more difficult. It also makes it hard to know if you have a foot injury, such as an ulcer or other kind of trauma. Wound Care. Having Diabetes can make it difficult to heal any wound. If that is coupled with Neuropathy (numbness) or poor circulation it can be extra difficult to get a wound to heal. There are many wound care products and treatments that can aid in the healing of difficult wounds. Diabetic shoes. Your feet need to be supported to avoid the pain of neuropathy or injury. As one of the only local podiatry offices that offer professional footware expertise in diabetic shoes, we ensure that you are fitted properly to avoid unnecessary damage to your feet with our dedicated Diabetic Shoe Specialist, Tracie. We have a wide selection of shoes that will fit your comfort and style in the following brands: Anodyne, & Dr. Comfort, & Dia-foot. Under Medicare, you may be eligible for a pair of diabetic shoes, annually. To determine if you qualify for this benefit, see Medicare Requirements for Annual Diabetic Shoes. Preventing injury from plantar warts. Diabetic's foot health is very important. That's why something like a plantar wart shouldn't be taken lightly. Avoiding warts from forming can help you avoid other foot conditions and can prevent infection. All too often, those with diabetes are ashamed of their disease. They deliberately avoid seeking medical care, even though that expands risks to their health. Here at Southern Oregon Foot & Ankle, we are compassionate and nonjudgmental toward all our patients. We welcome your visits and we are eager to help show you ways to reduce your suffering. If you have diabetes, talk to a podiatrist at our Southern Oregon podiatry office today. The sooner you being treatment, the greater the hope for a successful intervention to relieve your pain and worries. Call 541-776-3338 to get started.